Upon seeing the trailer for The Campaign, I wasn’t impressed. Despite the star power of Will Ferrell and Zach Galifianakis, I didn’t understand how this movie could actually be that funny. After its release, one by one people kept asking me, “Have you seen The Campaign?” All these people talked about how funny it was and so I thought I should probably see this movie when it comes out on DVD. However, I ended up getting a text from my friend asking if I wanted to see The Campaign. We went to the movie at 9 p.m. on a Sunday so for the first time ever we were the only people in the theatre. I thought it was awesome, but would the movie be worth while? Galifianakis and Ferrell fit their roles perfectly. Also, Dylan McDermott (Tim Wattley) nailed his character, who is a campaign manager. Add Jason Sudeikis, John Lithgow, Dan Aykroyd and Brian Cox to the mix and The Campaign truly had a stacked cast. Without those actors, I doubt the film would have succeeded. The good thing about this film is its timeliness. I really enjoyed the connection between this film and the upcoming 2012 presidential election. Everyone knows how ridiculous the political commercials are and how ambiguous debates tend to become. I don’t know if the writers and director meant to make a political statement through this comedy, but that was my interpretation. The movie was an over-exaggeration of political campaigns. It made fun of all the political cliches including kissing babies, smearing opponents through political ads and meandering around questions during a debate. I think that’s what made the film funny. 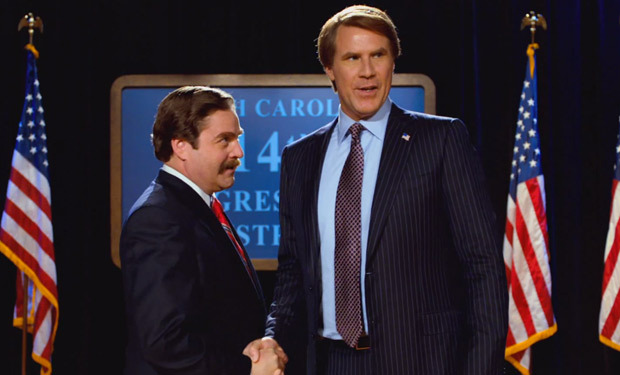 Political campaigns wouldn’t go to the extent of Galifianakis and Ferrell but it’s not so much of a stretch. THE BOTTOM LINE: With the star power of Galifianakis and Ferrell, the movie couldn’t fail. It’s worth seeing, but it’s no Ted or 21 Jump Street as far as 2012 comedies go. It also carries a political message, which gives the dumb humor some intelligence. I’ll give The Campaign 3 out of 5 cups. As of Sept. 13, The Campaign made a domestic total of approximately $80 million versus an unknown production budget, according to Box Office Mojo. The Campaign has a rating of 67% at Rotten Tomatoes while users at the Internet Movie Database gave it 6.4 out of 10 stars. To see the movie trailer for The Campaign, click here. This entry was posted in movies and tagged cup of joe, the campaign, the campaign review, will ferrell, zach galifianakis. Bookmark the permalink.